Keeping your dog’s ears clean is a very important part of proper grooming. Like humans, a dog’s ears can accumulate dirt and debris, which can cause a number of problems, including discomfort, hearing loss, and infections. All dogs should have their ears cleaned, but it’s particularly important for breeds that have long ears, such as Cocker Spaniels, Bloodhounds, Basset Hounds, Irish Setters, Afghan Hounds, and Beagles. Since their ears are longer, it’s much more likely that dirt and debris will get trapped inside. By making ear cleaning a focus of grooming, you can ensure that your pet has healthy ears and avoid serious problems. But how do you go about cleaning your furry friend’s ears? – Sure, you can wash them out with dog shampoo while you’re bathing him, but if you want to get the best results, then you’re going to want to use a specially formulated ear cleanser for dogs. There are a lot of dog ear cleaner products on the market, so how do you know what the best options are? We’ve consulted with experts in the dog care industry, including veterinarians and professional groomers. We’ve also assessed countless products and read through thousands of dog ear wash reviews. Our research, coupled with the input from our panel of experts, has lead us to select what we consider five best dog ear cleaners on the market. What is Dog Ear Wash? Now that you’ve had a look at our picks for the best dog ear wash, let’s take a closer look at each one. Below, we offer a more detailed look at each of the products, including the features that they offer, what we like about them, and what users and our expert panel had to say about each one. After looking over each product, once you a dog ear cleaner that you think will work the best for your furry friend, click on the buttons to find the best prices on Chewy and Amazon. 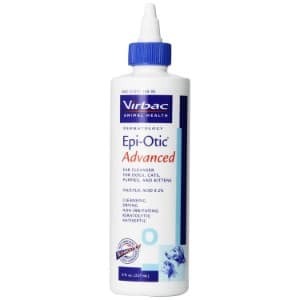 First up on our list of the best dog ear cleaner products is Virbac Epi-Otic Advanced Ear Cleaner. What really sets this product apart from the crowd is the formula won’t adhere to your dog’s ears. A lot of products can get stuck in the ears, which prevents effective flushing. This ear cleaner, however, will effectively remove dirt, debris, dead skin cells, and anything else that collects in your pup’s ears because it won’t stick to the surface of his ears. The formula also contains ingredients that offer antiseptic qualities, which helps to combat ear infections. In fact, this cleanser is specifically designed to prevent and manage conditions that affect dogs’ ears, such as otitis externa, an inflammation of the external ear. The formula is also has a low pH level of 2.2 , which allows it to neutralize your dog’s ears and maintain proper pH balance, thereby further preventing infections. It’s free of harsh chemicals, like alcohol and chlorhexidine, ingredients that can cause severe irritation. Our panel of experts and users both agree that this dog ear wash is highly effective. They say that it is easy to use and that it removes various types of debris from a dog’s ears. Low pH level of just 2.2, so it maintains proper chemistry in your dog’s ears. Final Verdict: Overall, we are very impressed with this dog ear cleaner. It’s specially formulated for regular uses, effectively removes all types of dirt and debris, and prevents infections. We were also impressed by how easy it is to use. 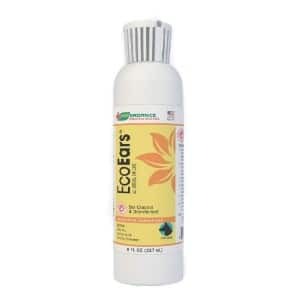 This All Natural Dog Ear Cleaner from EcoEars claims to be the #1 multi-symptom treatment for dog’s ears. It is specially formulated to combat a wide range of ear issues, such as itching, dirt buildup, and infections. It helps to restore the health of your dog’s ears in up to 10 days. It’s just as effective as a prescription dog ear medication, but without the high price tag. And best of all, you don’t have to go to the vet to get it! The ingredients are all- natural. It is completely free of harsh chemicals, such as alcohol, dye, steroids, and other ingredients that are commonly found in many dog ear cleanser products. With this product, you will be able to wash away dead skin cells, bacteria, and even the toughest buildup of dirt and debris. Users are very impressed with the 100 percent money back guarantee. If, for any reason, you are no satisfied with the results, the manufacturer will issue you a full refund with no questions asked. This dog ear cleaner is designed to combat all types of issues that dog’s often experience with their ears, such as dirt buildup, bacteria, infections, smell, and itching. The formula is all-natural and completely free of harsh ingredients, so there’s no need to worry about irritation. It’s guaranteed to offer results, and if it doesn’t, you will receive a full refund. Some users have said that this cleanser is difficult to use, but that is likely because they weren’t following the instructions. Final Verdict: Overall, we were very impressed with this high-quality dog ear cleanser. We found that it is quite mild and that it doesn’t cause any irritation. It’s also affordable and offers fast results for all types of issues. 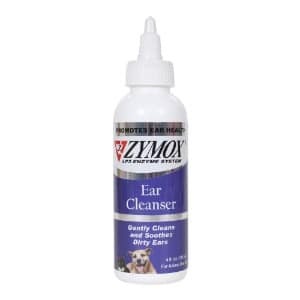 The anti-adhesive property of this Pet King Brands Zymox Ear Cleanser with Bio-Active Enzymes is why users are so impressed with this dog ear cleaner; and why our panel of experts was impressed by it, too. Since it doesn’t adhere to the inner surface of the ear, it effectively flushes out dirt and debris, which means that there’s no need to worry about the buildup of bacteria. Bacteria is the leading cause of ear infections in dogs, so it’s important to choose a formula that can help to prevent the buildup of these harmful contaminents. This dog ear cleaner is made specifically to manage otitis externa, which is an inflammation of the external ear (as noted above). The non-toxic chemicals mean that it’s completely safe for regular uses. It’s also free of harsh chemicals and cleansers that are found in so many other dog ear cleaner products, such as alcohol, dyes, and perfumes. That means that you don’t have to worry about irritation, which is a major bonus, especially if your pup has sensitive ears. Users say that they like how easy this product is to use, and that they noticed a major difference in the ear health of their dogs’ after using the product for just a short period of time. Final Verdict: If you’re looking for an affordable, high-quality ear cleaner for your dog that is free of harsh chemicals, than we think that you will be quite impressed with Pet King Brands Zymox Ear Cleanser. There is nothing worse than discovering that your pup is afflicted with an ear infection. It causes a lot of discomfort and can lead to serious issues if it’s not treated properly, such as hearing loss. 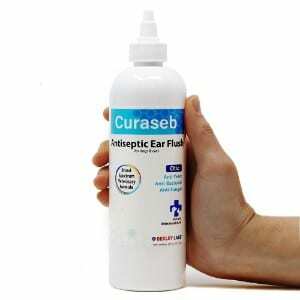 If your pup is prone to developing infections in his ears, than Curaseb Dog Ear Infection Treatment is something that you are definitely going to want to have on hand in your grooming supply kit. This dog ear cleanser is anti-fungal, anti-bacterial, and anti-yeast, which makes it highly effective for treating a variety of ear issues, including infections. It contains prescription grade ketocanazole and Tris-EDTA, which are ingredients that are commonly found in high-priced ear cleansers. Since it’s free of alcohol, it won’t irritate your dog’s ears, and it’s also antimicrobial, so it will help to treat a variety of problems, such as scaly patches, rashes, and even acne. This formula also contains aloe, which provides soothing relief. Users love how easy this ear cleanser is to use. The water-based formula effectively flushes the ears quickly and easily. It also helps to successfully wash away debris and deodorizes the ears, which will make snuggling with your pooch a lot more enjoyable. It can be used to combat a number of ear problems that dog’s experience, including acne, rashes, and patches. Final Verdict: For an easy to use, highly effective, and gentle dog ear cleanser, this formula from Cursab is a great option to consider. While some people did complain about the scent, we chalk that up to the fact that not everyone has the same sense of smell. However, in terms of effectiveness and quality, users across the board agree that this product is great. 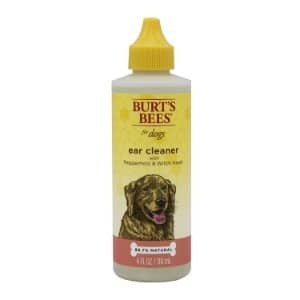 Last up on our list of the best ear cleaners for dogs is Burts Bees Ear Cleaning Solution. Burts Bees is a highly acclaimed manufacturer of a variety of health and wellness products for both humans and pets, and this ear cleanser definitely lives up to their name. Specially formulated to cleans, sooth, and remove excess moisture from the ears, this ear cleanser is great to use with all breeds, but particularly those that like to swim, such as Golden Retrievers and Labrador Retrievers. Just apply some of the solution to your pup’s ears when he gets out of the water and it will instantly remove any water that has collected in them. Made of all-natural ingredients, this product is great for everyday use. Witch hazel offers high powerful antiseptic qualities to prevent infections; it’s also soothing, so it will help to ease any irritation that your dog may be experiencing. Peppermint oil and tea tree oil also add to the soothing properties that this ear cleanser offers. You’ll also like that it’s free of harsh chemicals, such as sulfates and dyes. It’s also made in the USA, so you can be sure that it meets stringent quality assurance regulations. Final Verdict: If you’re looking for an all-natural solution to cleanse your dog’s ears and prevent infections, than we think that you will find that Burt’s Bees Ear Cleaning Solution for Dogs is a great choice. It’s affordable and contains natural ingredients. And, according to most users and our panel of experts, it does offer great results. Your dog is more than just a pet; he’s a member of your family! That’s why you go out of your way to make sure that you provide him with the very best of care. His dog crate offers the den-like feeling that dog’s love, his dog bed is highly supportive and comfortable, his dog house keeps him safe when he spends a lot of time outside, his outdoor dog kennel offers plenty of space to run when you can’t take him on walks, and his dog playpen gives you peace of mind when he’s playing, but you can’t keep your eyes on him. It’s also pretty safe to say that you’ve done extensive research regarding the other products that you use with your furry friend. For example, you probably feed him a dog food that is formulated to meet his nutritional needs, you offer him plenty of entertainment and exercise with the best interactive dog toys, and if he spends a lot of time outside in the heat, you might even use cooling pads for dogs or cooling vests for dogs to ensure that he is comfortable and safe. Of course, you also make sure that your pup is well-groomed. After all, proper grooming is such an important part of pet care. You keep his nails neat and clean with the best nail clippers for dogs, keep him fresh and clean between baths with dry shampoo for dogs, and even brush his teeth with the highest quality toothpaste for dogs. But there may be one thing that you are overlooking when it comes to grooming and caring for your dog: cleaning his ears. If you have never cleaned your dog’s ears before or you just added a pup to your family and don’t know much about the importance of ear cleaning, this section of our guide offers invaluable information. In our buyer’s guide, you’ll learn what a dog ear cleaner is, why cleaning your dog’s ears is so important, and the things that you should be looking for when you are shopping for a dog ear cleanser. As you can probably guess by the name, dog ear wash is a special grooming product. Essentially, it’s a solution that is formulated to remove dirt and debris from a dog’s ears. It also helps to prevent bacteria buildup and can clear up a number of conditions, such as itching, irritations, and rashes. It can also disinfect your dog’s ears and remove foul odors. Just like people, and all other animals, a canine’s ears need to be cleaned on a regular basis. Their ears easily collect all types of dirt and debris, making them very hospitable for bacteria, parasites, fungi, and viruses. As you can imagine, if your pup’s ears aren’t cleaned, nasty problems can arise, such as irritation, infections, and odor. Prevention infections. As mentioned, the bacteria, fungi, and parasites that can collect in your dog’s ears when they are dirty can cause serious infections. These infections are not only uncomfortable, but they can be highly painful and in severe cases, they can cause hearing loss. Reduces odor. Have you ever noticed that your pooch’s ears are a bit smelly (or maybe a lot smelly)? If so, that’s another good reason to wash his ears out with the best dog ear cleaner. Regular cleaning will eliminate the smell and make those puppy cuddle sessions a lot more enjoyable. Improved overall well-being. When your pup’s ears are clean, they won’t smell, and there’s less of a chance of irritation, infection, itching, and a number of other problems. In other words, cleaning your furry friend’s ears regularly will help to improve his overall health and well-being, which will make you both a lot happier. There are a lot of dog ear cleaner products on the market; however, and unfortunately, many of the products are not as effective or safe as you would hope they would be. They can contain harmful ingredients that can irritate a pup’s sensitive ears. Additionally, they may not be able to effectively remove dirt and debris. And lastly, many dog ear cleaners can actually make your pup’s ears worse than they were before you cleaned them! High-quality ingredients. Dog’s have sensitive ears. That means that you want to make sure that the ingredients will effectively help to remove dirt and debris without irritating your pup’s ears. Look for formulas that are free of alcohol, sulfates, phosphates, and other manufactured ingredients. Instead, look for something that has natural ingredients, such as witch hazel and tea tree oil. Gentle formula. Make sure you choose something that is formulated for regular use. While some products may contain safe ingredients, they may contain high amounts of those ingredients, which can cause serious damage to your pup’s ears. Easy to use. Look for something that is easy to use. It should effectively wash out dirt and debris from your pooch’s ears. Non-stick formula. Thin formulas wash out easily and prevent bacteria buildup, which can cause infections. Cleaning your dog’s ears is a very important part of grooming and overall care for your pet. By using one of the high-quality ear cleansers for dogs in our review, you will be able to ensure that your furry friend’s ears are healthy and that he is happy!